Write a note: An email may not always be appropriate. Technology has been driving us to new goals that are faster, more efficient, and instantaneous. But we have very few rules of business etiquette for it. We are taught how to beat the competition, think strategically and get the best return on our investment, but we are not being taught the best method to get there. The Big Book of People Skills Games tells you of situations where email is not the best form of communication. It underlines situations when the phone or a handwritten note may be a better idea, and when in-person communication is the best. Emails may be the most used and may, in fact, account for the most common social faux pas. We send them quickly and expect a quick response. We now abbreviate and use shortened variations of words, and feel any time or place is appropriate to check email, text, even play games. Whatever happened to etiquette? • Email is still a business communication. Watch grammar, spelling and abbreviations. People will judge your email just as critically as they judge a business letter. • Use the subject line. It may get your message read a little faster and the reader will be able to find the message for future referral. This could be the most important part of your email and message. • Don’t use email when a handwritten note is more appropriate. 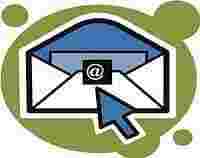 • If you get a request addressed to numerous people, respond only to the sender unless requested to do otherwise. • Read all your emails before responding. Go to the most recent ones first and you may discover earlier messages have been amended or updated. • Be discreet about sending jokes and other questionable comments. You never know who may receive or pass on something you thought would remain private. • Respond to emails or ask to be removed from unwanted routing lists. email. Legally, employers have the right to read all employee email on their computer systems. Thirty-two per cent of large US companies pay people to read employee emails. According to Proofpoint Inc., 28% of large US companies have terminated employees for email policy violations. • Don’t let email (or any other written form of communication) substitute for discussing important issues in person. • If emailing internationally, keep the language as formal as possible. Casual language, clichés, jargon and slang words or phrases may have different meanings elsewhere. • Make sure you have a signature line at the end of your email message. Quick reference to your full name, title, company, address, phone, fax, email and website will make it easy for people to contact you. • If you are out of office for an extended time, use the “Out of Office" tool so people sending you emails will know that you are not available to answer immediately. You can provide information about your return, other ways to contact you if necessary, and any other details, but keep messages short and concise.